"Sometimes God likes to put two guys in a paper bag and just let 'em rip." Though we typically watch movies to escape reality, there are those films that effectively depict realistic situations. These are often the most difficult films to pull off, as they need to entertain without becoming too far-fetched. 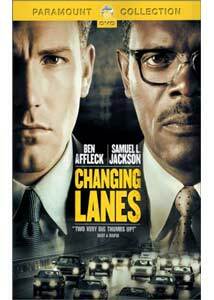 Changing Lanes is a film that simultaneously subscribes to this concept and violates it. While full of implausibility, the core of this story about the dualistic nature of human beings is so engrossing, so expertly written, that it is easy to become wrapped up in the positive elements while the negative elements pass by unnoticed. The film centers on two New Yorkers from completely different walks of life. Gavin Banek (Ben Affleck) is the young hotshot lawyer blessed with a life of personal and financial success that may not be as perfect as he is led to believe. On the flip side of the coin is Doyle Gipson (Samuel Jackson), the financially unstable recovering alcoholic whose propensity towards rage has resulted in separation from his wife and two children. Their lives collide when they are involved in a fender bender one morning on FDR Drive, which leads them to spend the rest of the day inflicting revenge upon one another through a series of cruel acts. What transpires is a startling day of self-realization for both men. The power of the screenplay by Chap Taylor and Michael Tolkin lies in how deeply and honestly it portrays these characters as real people. Both Gavin and Doyle, though seemingly the antithesis of one another, represent the everyday man, which makes their multitude of emotions easy to understand. Just like the most common individuals, both men possess great strengths and weaknesses. Their actions can be both appalling and inspiring, and the tightly written screenplay rarely allows the audience to take sides with one character over another. The film is not simply a generic tale of revenge, but more of an exploration into the unsatisfactory way that these men have been living their lives, and what they can do to change this. On a deeper level, the film explores the importance of morals and values in a world that is slowly slipping into a desensitized state of apathy, anger, and deceit. The intrigue of the central characters is heightened by two fantastic performances. Cast against type, the always riveting Samuel L. Jackson seamlessly slips into the role of Doyle Gipson and gives one of his best performances in years. Ben Affleck also turns in a fantastic performance, finally proving that he is a talented actor rather than just a movie star. The film also benefits from a powerful supporting cast, including such great performers as Toni Collette, Sydney Pollack, and William Hurt. Though much of Changing Lanes appears to have a cynical view towards the state of humanity, it does end with a message of hope. Ironically, this is the film's biggest letdown. The upbeat message would have been acceptable if it did not add a false sense of easy resolution to problems that are going to require much more determination. This ending feels somewhat manipulative after witnessing the prior eye-opening events. However, I must remember that Changing Lanes is only a movie. It is a far-fetched, fictional film, which just so happens to be incredibly honest, insightful, and entertaining. Image Transfer Review: The 2.35 anamorphic image transfer is generally beautiful, but a little inconsistent. Taking place during one rainy day in New York, the picture tends to convey the dismal mood of the film. The outdoor scenes boast a tremendous level of depth and clarity, while backgrounds within dimly lit interiors look a bit more fuzzy and compressed. Color is consistently vibrant throughout, proving to be the transfer's number one standout. Frequent edge enhancement is the biggest downfall, often giving the picture a harsh aesthetic. Otherwise, detail is stunning, particularly during extreme close up shots. Changing Lanes is not one of the better transfers I have seen, but the shortcomings are not problematic enough to distract from the impact of the film. Audio Transfer Review: The Dolby Digital 5.1 soundtrack suits the nature of the film quite well. The soundtrack is predominately quiescent throughout, though there are several intense moments that bring this multi-channel soundtrack to life. Surrounds are gentle, yet fully utilized when necessary with the convincing sounds of traffic and wind. The LFE is occasionally intense with pulsing music, yet I found the bass to have somewhat of a hollow sonic characteristic. Being primarily a dialogue-driven film, spoken words are delivered through the center channel with exceptional clarity; I only detected one minimal instance of distortion. Though not award winning material, the soundtrack excels in terms of effectively driving the narrative of the film. Extras Review: Though not a major disappointment, the special features section is where the disc is somewhat lacking. In addition to a meager number of extras, the quality is not up to par with what I would have expected for such a fine film. First is the feature-length commentary with director Roger Michell. Michell delivers a professional analysis of his film that leans towards the technical side of filmmaking. He discusses everything from cinematography, to music, to location, but very little about the story. While I cannot say anything negative about Michell's ability to give an informative commentary, I would have liked to hear more discussion on the central themes in the script. While budding filmmakers will most likely prefer this director's commentary, I would have preferred a screenwriter's commentary for this film. The first of two featurettes is titled The Making of Changing Lanes. This is one of the more drab behind-the-scenes specials I have seen in quite some time. The entire 15 minutes is spent presenting footage from the film, while the actors and Roger Michell discuss the content of the film. Other than a brief moment that gives praise towards the directorial techniques of Roger Michell, there is no solid information on the making of the film. The next featurette, titled A Writer's Perspective, is what I truly wanted to see. Presented in anamorphic widescreen, screenwriters Michael Tolkin and Chap Taylor offer insight into their inspiration for creating a story that deals with morality. Like the previous outing, there are far too many clips from the film, but this featurette contains plenty of interesting and enlightening comments on the core of this fascinating story. There are two deleted scenes and one extended scene, all presented in nonanamorphic widescreen. I was surprised to find that these scenes are all very powerful. While not necessary, their inclusion could have made a strong impact in the finished film. Finishing up the short collection of special features is the theatrical trailer, presented in nonanamorphic, 1.85:1 widescreen with 5.1 sound. It would have been very easy to spoil the entire film through a two-minute trailer, but excellent editing helps to shroud the film in intrigue. Changing Lanes is a gripping film with a strong message, thanks to an intelligent screenplay and first-rate performances. The fact that many flaws went by undetected during my initial viewing is a testament to how powerful the film truly is. Complete with commendable audio and video transfers, this release is well worthwhile.